What would you do if you got on a plane, and someone had pooed on your seat? Because that’s exactly what’s happened to a man in Atlanta. No, we aren’t kidding. Matthew Meehan literally sat in feces, leaving his pants and shoes smeared with poo. 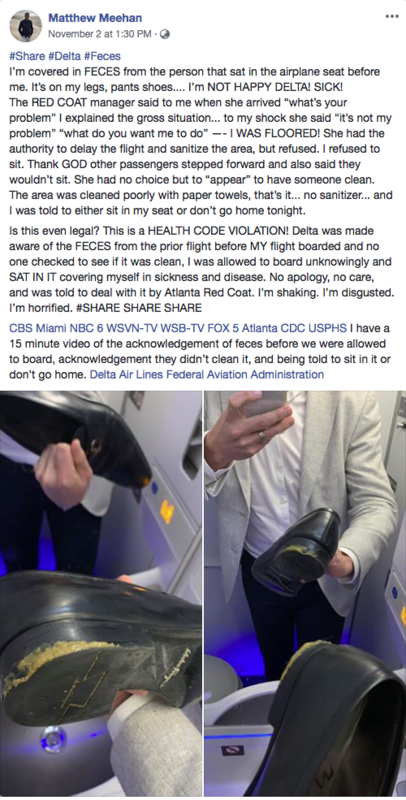 Last week, he was boarding a Delta flight from Atlanta to Miami and noticed the plane smelt a little gross. After reaching under his seat to charge his phone, he discovered the source of the smell: actual human feces. “It’s not just a smell,” he told Yahoo News. Understandably, Meehan wanted to know where the poo came from and how on earth he ended up sitting in it. “Originally, the flight crew said that it was a German shepherd,” he told Yahoo. The fact that human feces somehow wasn’t cleaned up before the flight is gross enough – but according to The Sydney Morning Herald, Meehan was offered nothing but two paper towels and some gin to clean himself up with. Oh, and when he returned to his seat, it still hadn’t been cleaned. Flight crew told him to talk to a gate agent about the issue, but when Meehan found a manager at the gate, he was told to either deal with sitting in poo, or take another flight. Expecting someone to sit in feces for almost two hours seems reasonable, right? The answer is no, people! “I said, ‘Can we get that cleaned up so I can sit down?’ ” Meehan told Yahoo. After getting back on the plane, Meehan and several other passengers refused to sit down until the area was cleaned. Eventually, someone boarded to clean the plane, but Meehan said there wasn’t any disinfectant in sight, despite Delta issuing a statement confirming the area was sanitised. “To avoid causing a commotion, the manager had someone clean that area with paper towels,” he told Yahoo. The area was still obviously soiled, and Meehan laid blankets on it before enduring the flight. This week, Delta released a statement apologising to Meehan and acknowledging that “the area around his seat was not appropriately cleaned following an incident involving an ill emotional support animal”, but didn’t explain how the mess went uncleaned for so long, or how it happened in the first place. Meehan has been offered a refund from the airline for his flight, shoes and suit – but has said it’s too late and is talking with lawyers, The Sydney Morning Herald reported. This one time a bird pooped on our car windshield with such force that it left a crack. Probably not as serious as what happened here, but still annoying. Happy Friday! Here is a bunch of pictures of a very handsome pilot that Instagram is losing its mind over. You can thank us later.